My uncle Bill called the other day and somehow we started discussing the beetle that he and Jesse discovered and gave to my mom. He identified it as a June Beetle and I think he's correct. According to my 5 seconds of internet research, I've tentatively identified it as a ten-lined june beetle (Polyphylla decimlineata) which can be found here. 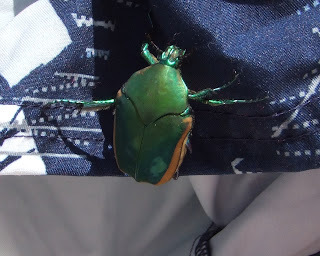 I think we have another species of beetle down here in California which is also called a june beetle. Ours sounds like a bomber and is bright green. I keep hoping to find a dead one since I haven't had the heart to kill one. This one landed on Chris' swim trunks last summer. Was the beetle in the swim trunks? His shorts were laying on the picnic table drying after a dip in the pool. I haven't seen any of them this summer.